The Soviet Era in Russia and Central Europe was a time for weird futurism — especially when it came to urban architecture. 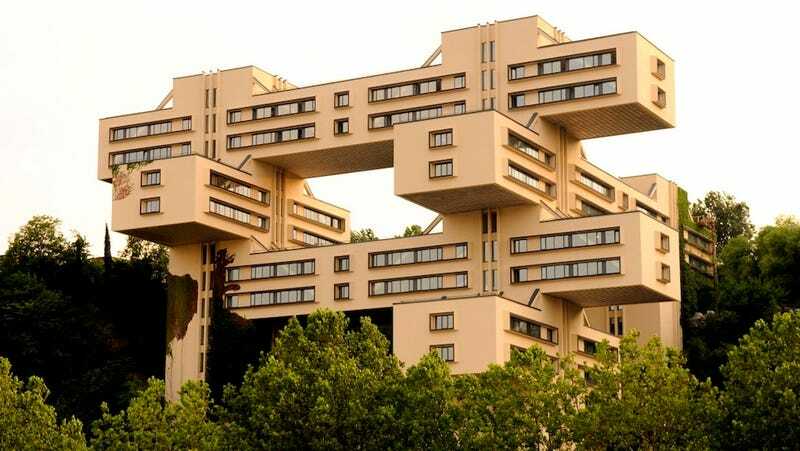 These buildings reveal what the Soviets imagined the cities of tomorrow would look like. The Derzhprom (or Gosprom) building in Kharkiv, Ukraine, designed by Sergei Serafimov, M. Felger and S. Kravets, completed in 1928. The former building of the Ministry of Roads in Tbilisi, Georgia, designed by Giorgi Chakhava and Zurab Jalaghania, completed in 1975. Now it's the headquarters of the Bank of Georgia. An ethnographic museum built in 1978, into the side of Sulayman Mountain to protect some petroglyphs found in a cave there. More holes were blasted and carved into the holy mountain of Muslims to add some exhibition area. The Circus of Chisinau, Moldova, constructed in 1981 by S. Shoikhet and A. Kirichenko, closed in 2004. The Karen Demirchyan Complex (also known as Hamalir), a sports and concert complex on Tsitsernakaberd hill, above Yerevan, Armenia. It was designed by A. Tarkhanian, S. Khachikian, G. Poghosian and G. Musheghian and opened in 1983.